Thank you for the details supplied so far. If there are any changes in numbers let me know on any of the contact details on the letterhead. If you know that you will be arriving after 10.30pm please let me know by Thursday evening. If there are problems on the journey please phone me on 07780 692279. If you are unable to get through then try the hostel on 0870 770 5856 and leave a message. I will be at the Hostel from 16-00, let me know if you have anyone arriving before that time. On arrival, report to the hostel reception. Car parking will be tight and it’s easier for everyone if mini-buses park in the bottom car park and cars next to the main hostel building. Each Coach/Group Leader is responsible for their own Regional Group in terms of discipline, first aid provision and bedtime. Athletes need to be making their way to bed at 10-30 with lights out at 10-45pm. Stress on your juniors that the coaches who will be driving home on Sunday will have a long day and it is important that they get a good night’s sleep in preparation for the long journey home. You are responsible for your group at all times including checking your group in and out of the forests. Following the incident of vandalism last year I also ask that you check your group’s rooms on arrival and departure. It is still early but the provisional forecast for the weekend is temperatures between 4 and 8°C with a northerly wind between 5 and 15 mph. On both days it will be mainly overcast with a high probability of showers with some sunny periods. With the temperature and possible showers forecast make sure your juniors and coaches bring plenty of appropriate clothing. For those who suffer from cold feet then extra pairs of dry socks will be essential as the marshes will be wet and cold. All regions need to have their usual parental consent and medical forms for everyone (Coaches included) readily available all weekend. In line with the Squad Co-ordinators decision; juniors must not be allowed to have alcohol. Hostel rules state that quiet must be observed after 11.00pm. Also muddy and wet orienteering shoes should not be worn inside any YHA building. A copy of the Programme will follow. Could you ensure all of your group are on time for the sessions and know where to meet. Unless stated otherwise, meetings will be in the classroom. 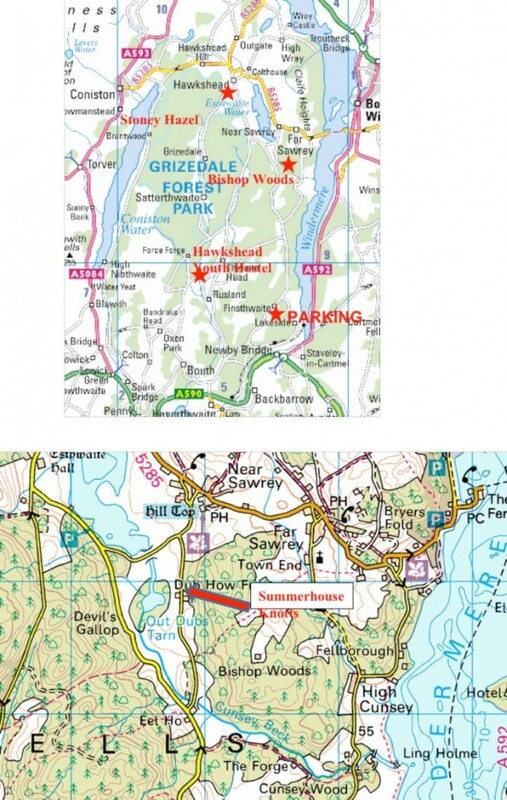 Training areas are Bishop Woods, Stony Hazel and Summer House Knotts. After breakfast on Saturday morning the control hangers will put out the controls. On Sunday they will start collecting controls at 2pm. Note we will be using full size kites on 1m canes loaned by AIRE and these are identified by attached number codes. Your maps will be available on Friday evening and I will hold a briefing for coaches in the classroom at 8.45am Saturday. Training on Saturday will be on all 3 areas. Stony Hazel is not available on Sunday as the only parking is at the church and there is a morning service. I will allocate regions to different areas on each day to keep the numbers on the areas fairly even. If you have a preference of order let me know by return. Pre-marked maps with courses and control descriptions printed on waterproof paper by print5 are available for all juniors. Each coach/adult will have an all controls maps of each area, BUT IT IS UP TO REGIONAL COACHES TO DECIDE HOW THEY WOULD LIKE THEIR GROUP TO USE THE CONTROLS. PDF’s of maps and courses to follow. Remember, it may be in your interests to let others start rather than everyone starting at the same time. It is best to do exercises correctly rather than rushing. You do not have to use the controls provided; i.e. you could plan a line and may hang small training kites, but you must not go into any out of bounds areas. Your more experienced juniors could use small kites or tokens and follow a trains exercise. All areas have crags, so please take care, particular with planning downhill legs. There is some bracken in the areas but it should not pose a problem for athletes. It is not advisable to go into areas with the undergrowth screen. 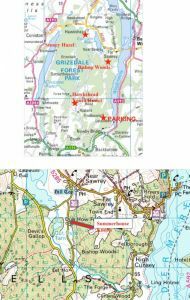 Both Stoney Hazel and Summerhouse Knotts have areas of wind blow from the storms in 2010 that are not marked on the map but they should not be a major problem. Any hatched areas are out of bounds and must be strictly observed. Remember to report any wall damage on any of the areas. During the Saturday morning briefing you will be asked to mark your ‘assembly point’ for each day so that others will know where you are in case of emergency. Any queries associated with travelling to the areas e.g. directions etc. can be discussed at the weekend. You are responsible for transporting your own group. There will be no ‘O’ signs to the areas. Bishop Wood: Parking will be available at the farm (368949) on the northern end of the road shown on the O-map. It is suggested that drivers drop their athletes off near the start and then go and park. No toilet available. Summerhouse Knotts: Parking in the car park at St Peter’s Church, Finsthwaite. Stony Hazel: Parking in the parking area for St Paul’s Church, Rusland. Thieves operate in the car parks so please be careful with valuables. Please park with care and do not block access. The nearest casualty, accident and emergency units are Kendal and Barrow. Barrow is easy to find as it is well signed, follow the red H from the outskirts of the town. Kendal’s is near Asda on the A65 south from the Town centre. From Newby Bridge into Kendal, at the first traffic lights turn right, at the roundabout ‘straight’ on then fork right at the next lights. Remind juniors to bring torches/headlights for the night event. We will be using Sportident kindly loaned by EBOR. We will need help from coaches to run this event. Juniors need to bring ‘O’ Kit for two days, compass, sportident card, whistle, drinks bottle/flask, waterproofs, hat, gloves and plenty of warm clothing. Food will be provided and will cover; light supper on Friday evening, Saturday breakfast, packed lunch, evening meal and light supper, Sunday breakfast and a packed lunch. I will provide squash, tea, coffee and hot chocolate which will be available in the member’s kitchen.